When fall arrives, you know what that means—pumping spice everything, apple picking, and corn mazes! Maine is home to plenty of corn and farmland so you don’t have to travel very far with the kids in search of a weekend of fall fun. So, throw on the flannel, fill your mug with a pumpkin spice latte, and head to your nearest corn maze! This family farm located in the Southern Maine town of Dayton has a six-acre corn maze to keep the kids busy all afternoon long. Each year the maze has a theme. In 2016 it was K-9 Heroes and in 2015 it was a Haunted Maze. The corn maze generally takes about an hour to complete and there are lots of other activities like a pumpkin patch, farm animals, and even a corn launcher. Ricker Hill Orchards is one of the largest apple producers in the state with its own hard cider and winery. During apple picking season, you can enjoy a whole host of activities ranging from a giant hay slide to a corn box to a bounce house. The corn maze is designed to be completed in a half hour. Open from spring to fall, this family farm has lots of fun activities for everyone. 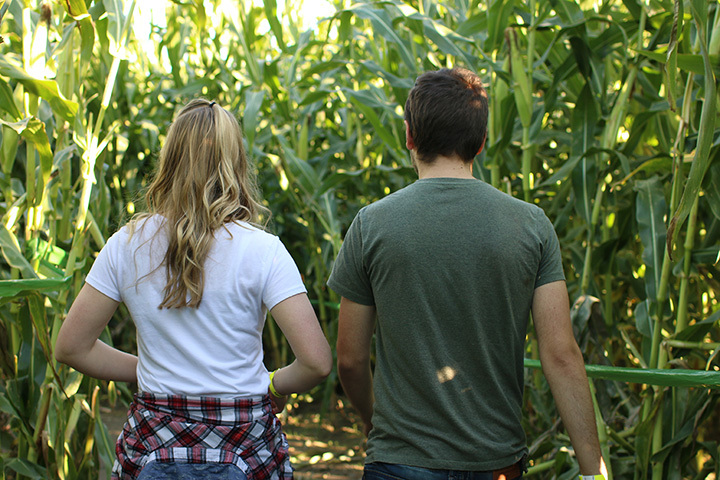 From Gifford’s Ice Cream to blueberry picking to tons of Cortland and McIntosh apples, make sure you save time to get lost in the famous corn maze. Each year, the themes are incredible. There is even a special night maze night! Zach’s Corn Maze in York is a fun corn maze cut into 17 acres of cornfields. You’ll need to hop on a hayride for 20 minutes to get there, which adds to the excitement. Once you’re done finding your way through the maze, make sure you hit up the pick-your-own pumpkin patch. Starting in October, you can even play flashlight tag in the maze from 7 p.m. to 10 p.m.! Every fall, Sandy River Farms opens its doors to children and adults of all ages for some fall fun in the fields. This working farm has been in the York farm since 1961 and sells great organic milk and produce at their farm store so you don’t want to miss that. Just around the corner you’ll find the pick your own pumpkin patch, too. Across the street from the Thunder Road Farm roadside farm stand in the small town of Corinna near Bangor you’ll find the beautifully designed corn maze open to children and adults of all ages. The corn maze can be down in two sections making it family-friendly for small children. There is also a ton of other fun activities like a jumping pillow and cow train to keep the kids busy all afternoon. Goughan Farms in Caribou is a family owned and operated farm in Aroostook County. Open year-round, this farm sells everything from berries to Christmas trees to Maple Syrup to Pumpkins. During the Fall months, you’ll want to visit their corn morning for a morning of fun. Every year the theme helps a local charity. Last year it went to helping Dixie’s Chicks Feed the County. This working family farm is open for the fall season after Labor Day. With lots of farm animals to feed, apples to pick, and corn mazes to conquer, you’ll have plenty of fun here. Every year McDougal Orchards carves a word into their corn maze for you to figure out. Once you’ve completed your mission you can enjoy some freshly-made cider donuts. View more Maine Corn Mazes.